In the last lesson, consonant clusters were introduced conceptually as a blend of two or more consonants. One type of consonant clusters was examined. The nasal letter (the fifth letter of each of the first five rows) was able to bind with any of the four other letters within that row. The nasal element clusters were only one kind of specific consonant cluster. This lesson, Lesson 6, deals with a general method of mixing two or more consonants. This lesson will expand our knowledge of how to read and write new letters and sounds. 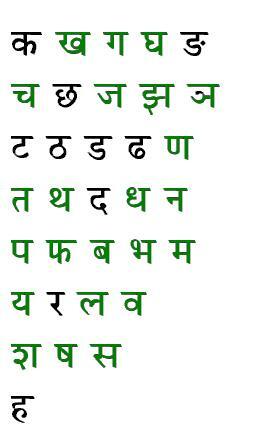 This table shows the listing of the consonants of the Devanagari alphabet. The ones in green are the consonants with the “stick. Only ten consonants have no stick. For the one’s that do have sticks, making consonant clusters is very easy. In fact, this is merely an application of what discussed in Lesson 5, when the example was introduced with ña and ca, forming ñca. Let’s make the letter ṣṇa. As clearly seen, the letter ṣṇa is made of ṣa and ṇa. Since, ṣa (the first letter) is a stick letter, the stick is taken off, forming the half-letter ṣ. 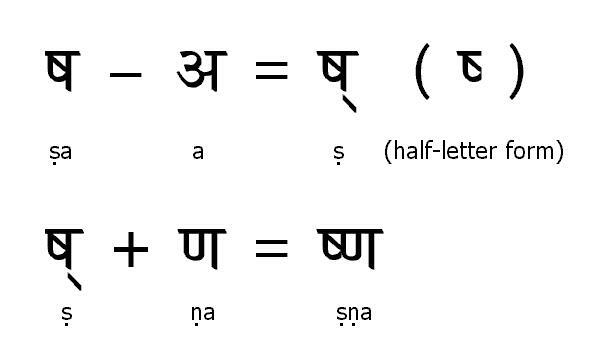 Then, the half ṣ binds with ṇa to form ṣṇa. With this letter learned, words like Kṛṣṇa can be finally made! Unlike other chapters, this material is something that needs great focus in independently. Therefore, emphasis will be on the ability make consonant clusters. In this spirit, let’s try another example. Let’s write the letter “khya.” The two letters involved will be kha and ya. Since kha (the first letter) is a letter with a stick, the stick can be removed to form the half letter form of kha. 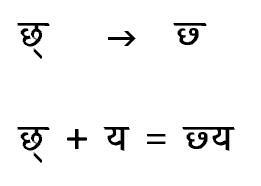 The half letter kha (kh) will bind with ya to form khya. For the most part, the general rule for consonants with the stick remains the same. There are notable exceptions which will be discussed in Lesson 7. Of those ten consonants, we can eliminate two of those. The letter “ńa” was discussed in the previous lesson when making nasal clusters with ka, kha, ga, and gha. The letter “ra” can be taken out, for the letter “ra” is an exception to almost everything out there. For that reason a whole lesson will be devoted to it in Lesson 8. Therefore in this lesson, there are only eight consonants that are worthy of our current attention. Unfortunately, there is no real general rule to form one whole character. Therefore, each of the eight letters will be discussed separately. Please do keep in mind that usually, if it looks difficult to mix two letters in such a way that the reader can see which two letters were used, then the virama could be used for the first letter. Except for a few letters that will be discussed in Lesson 7, “ka” will usually cut off the right arm forming a half-letter form looking like Figure 6.5. Here are examples of ka using this half form. The letter “cha” will shrink most of the time in order to bond with most letters. Figure 6.8 shows this with an added example of cha + ya = chya. The four letters of the cerebrals without “sticks” will form generally by the virama rule. However, if the second letter is a cerebral, then the “bottom rule” applies. If the second letter of the cluster is a cerebral (with the exception of “ṇa”), then the lower half of the second cerebral is placed below. Figure 6.9 shows how ṭa and ṭha are mixed to form ṭṭha. The letter “da” is a very tricky one. Depending on the second letter, it can do a lot of things. The last letter in this discussion is “ha.” For the most part, the mid-tail of the “ha” is used as a starting point for most mixes. Figure 6.13 shows the half-form of ha. For example, here is how “hma” is written in “Brahma” as shown in Figure 6.14. As mentioned before, this lesson emphasizes on the formation of the clustered letters and not necessarily on words. Therefore, the practice exercises below are straightforward in forming letters only. Identify the consonant cluster shown below.